Although medicine has evolved rapidly with advances in biotechnology, many therapeutic procedures still require diagnosis of disease at an early stage to enable effective treatment and prevent irreversible damage. Direct visualization of cross-sectional tissue anatomy and physiology provides important information for the diagnosis, staging, and management of disease. 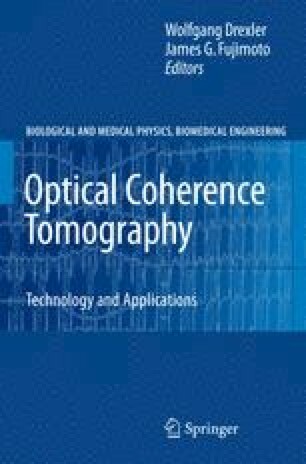 Optical coherence tomography (OCT) is a promising noninvasive, noncontact imaging modality that uses coherence gating to obtain cross-sectional images of tissue microstructure with micrometer spatial resolution . OCT was first used clinically in ophthalmology for the imaging and diagnosis of retinal disease . Recently, it has been applied to image subsurface structure in skin, vessels, oral cavities, as well as respiratory, urogenital, and gastrointestinal tracts. In this chapter, we describe a combined MPM/OCT system that allows studies of OCT scattering contrast with the sub-cellular resolution [7–12]. In addition, we present an SH-OCT system that combines the nonlinear optical effect of SHG and coherence gating of OCT to produce highly contrasting cross-sectional images of biological tissues [13–18].